The NX-820HGK is the new kid on the block but boasts some impressive stats. This mobile comes with a whole host of options including Built-in GPS. Status messaging is available with this mobile as well as programmable status message buttons. These mobiles utilize the proprietary NXDN technology making it harder for the general public to listen in. If you’re in a loud environment you can add an optional external speaker. 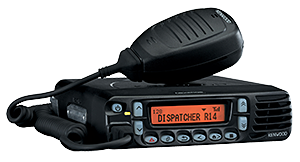 With a 3 year warranty and Kenwood's proven track record, this mobile is perfect for most businesses and fleets. The NX-800K is the workhorse mobile on our network. An improved LCD screen makes reading messages a little easier along with the option of setting up status message for one of the 6 programmed keys. Built for business, the NX-800K mobiles will outlast any other option currently on the market. These mobiles utilize the proprietary NXDN technology making it harder for the general public to listen in. If you’re in a loud environment you can add an optional external speaker. 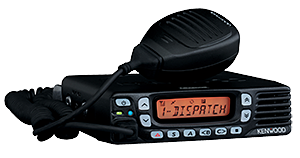 With a 3 year warranty and a proven track record, this mobile will stay in your fleet for years to come. The NX-5800K is the newest mobile addition on our network. An improved full color 2.55" TFT display makes reading messages a lot easier along with the option of setting up status message for one of the 6 programmed keys. Built for business, the NX-5800K mobiles will outlast any other option currently on the market. These mobiles utilize the proprietary NXDN technology making it harder for the general public to listen in. If you’re in a loud environment you can add an optional external speaker. With a 3 year warranty and a proven track record, this mobile will stay in your fleet for years to come.